When the nineteenth century opened on this area the hills and valleys were covered with a dense growth of hardwoods, pines and hemlocks. Much of the valley was swampy and almost impenetrable but there were some exceptions. Charles Johnson, who arrived in 1803, chose his land because there was an opening in the forest of about fifty acres, which he could put under cultivation without the labor of clearing it. Most of the settlers had to cut and burn the trees before they could sow wheat or corn. As there was no market for lumber, in fact no saw mill within reach, the trees were cut and as soon as dry enough were burned. This had its advantages as the wood ashes could be gathered, water leached through them to secure lye, which could then be boiled down to produce “black salts”, or potash, which could be sold. This was often the first and only cash-producing product, which the settler could hope for until his crop of wheat or corn could be harvested. Meat could be had if the pioneer was handy with his gun. Deer, bear, raccoons, rabbits, partridges and wild turkeys were all present in the woods and wildcats and wolves were ready to kill the cows if they wandered far a field. Before the fields and pastures were cleared and fenced all the cattle wore bells to frighten off these animals and so that the stock could be located in the woods and brought home to yard or barn for the night. Bears were partial to pork and the pig pen had to be high and strong to protect its occupants. The Holland Land Company owned all this land and was so eager to sell it that credit was given settlers if they would clear some land, build a cabin and raise crops. The settler “articled” his land; that is, he entered into a contract to make the required improvements on his land and to pay an greed sum each year until principal and interest were paid in full, when he would receive his deed. Land about here was sold for from $2.00 to $2.50 per acre. Many settlers were never able to complete their contract and so either sold their interest in their claims or the land reverted to the company. When the pioneer arrived at his selected home site the first task was to fell trees and build a logcabin which would serve as a home until mills were built and he became prosperous enough to have frame buildings. The log cabin usually had holes for windows, sometimes covered with cloth in winter, as glass was an expensive luxury. A blanket often served for a door. A fireplace of stone or sticks and clay was usually built a fire on the earth floor. How these hardy folks survived a winter is a mystery to us who live in warm modern houses. Wood was the only fuel but there was plenty of that. The man who could handle an axe could build his cabin, shelter his stock, fence his land, and provide fuel with no other tools. Oxen were preferred to horses because, although slow, they were strong and capable of hauling heavy loads. There were no roads until enough settlers had come to build them. Trails were followed and enough trees cut to let the cart or sled through. If the mud became too deep for passage tree trunks were laid across to form “corduroy road”. In the fall of 1803 Charles and Oliver Johnson, brothers, made the first purchase of land in Boston, paying $2.25 per acre. The following spring Charles came into the valley with his family and ettledust south of where Liebler Road joins Route 219. Oliver Johnson, Samuel Eaton, and Samuel Beebe came a little later, settling nearby at the north. In 1805 Deacon Richard Cary, veteran of the Revolutionary War, arrived with a sickly wife and eight children, settling just south of the Johnsons. He had three cents in his pocket and a debt of two dollars but he eventually became a prosperous farmer. His first cabin was twelve feet square, with cloth windows and a blanket for a door, but it sheltered the family of ten. Both the Johnsons and Deacon Cary had to take their first crop of wheat forty miles to Chippewa to have it ground. In the following years came: Jonathan Bump, Benjamin Whaley, Job Palmer, Ethan Howard, Kester and Serrill Alger. The first frame barn was raised at Charles Johnson’s in 1807. The following year Asa Cary, a brother of Richard, took up land south of his. Finally in 1809 a grist mill was rectedy Joseph Yaw, probably near where Boston Village now stands. In 1811, a Free Will Baptist Church was organized and soon after built a church which stood east of Route 219, between Liebler Road and Maplewood Cemetery. Years later when this church ceased to function, the building was moved to Patchin road and converted into a hide house at a tannery. In this church the Rev. Cyrus Andrews preached for ten years. Another Baptist minister, eRev. Clark Carr, settled near the Concord line and preached around here throughout his life. The War of 1812 brought dismay to the settlers, as it was feared that the Indians stirred by the British would raid the settlement. Charles Johnson (afterward colonel) was captain of the ilitia. Joseph Palmer’s barn was stockaded; that is, and enclosure was built about the barn by erecting logs to form a primitive fort, as a place of refuge in case of need. When the British burned Buffalo some of the men were there trying to defend the place. Deacon Cary’s son Calvin, a twenty-one year old youth who weighed over three hundred pounds, was attacked by three Indians; he shot one, killed one with his clubbed musket, and was killed and scalped by the third. Soon after the war the Torrey family located in what is now Boston Village, long known as Torrey’s Corners. Captain Torrey kept a tavern there and his sons Erastus and Uriah became prominent citizens. Talcutt Patchin, who served in the regular army and was sounded at the battle of Chippewa, married a daughter of Richard Cary and settled north of the settlement later of bear his name. The Town of Boston was formed on April 5 th , 1817 by dividing the Town of Eden. The name was doubtless borrowed from Massachusetts as New England place names are repeated in many states all the way to Oregon. The first town meeting was held the next year and Samuel Abbott was elected supervisor. Other officers elected were; town clerk, two poor masters, three assessors, four commissioners of highways, one collector, three commissioners of common schools, two constables and twelve overseers of highways. From this record it is clear that considerable settlement of the town had taken place and we read that there were one hundred and fifty-three taxable inhabitants in the town. It was voted to build a pound, where stray animals could be kept until claimed by the owner, and Charles Johnson was elected pound master. Fifty dollars was to be raised by taxation to cover town expenses. Of course a dollar was of far greater value than in the twentieth century, and dollars were very hard to come by. The following Quakers were taxed four dollars each in lieu of military service; Mathew Middleditch, John Kester, Stephen Kester, William Pound, David Laing, Thomas Twining Jr., Aaron Hampton, and James Miller. One result of this meeting was a law that , “Any person who shall suffer a stalk of Canada thistle to bloom on his or her lot or farm shall pay a fine of fifty cents for each blossom to any person suing for the same.” Evidently, there were weeds in the wilderness and foreigners at that. In February 1818, Aaron Skinner, then twenty-one years old, started from Shelburne, Mass. to walk west to seek his fortune. He walked across part of Massachusetts and all of New York State, nd from Buffalo walked on the ice on Lake Erie to Camp’s tavern (near where Camp Road ends). From there, he and three other young men walked to White’s Corners (Hamburg). He later wrote that the snow was so deep that there was no work and there was little money in circulation. He went to Batavia, probably walking, seeking employment, but found none and so returned to White’s Corners. When spring opened, he with Linus Dole, took a job of clearing land at $22.00 per acre of a man by the name of Coburn, on Eighteen Mile Creek a mile or two above Johnsonburg. (Probably where the Johnson brothers lived.) He taught school in North Boston and Boston in winter and in summer worked on farms until he was able to buy a farm. 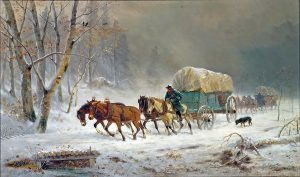 In 1819, Solomon Fosdick drove a covered wagon from Rensselaerville, near Albany, to Buffalo and then out to Boston, where he worked as a carpenter for many years. At first the family lived in a log cabin east of Route 219 a little north of the intersection of the Boston Colden Road. “Living in a log cabin with nine children could not have been, even under the happiest circumstances, an easy arrangement,” wrote Raymond Fosdick, a lineal descendant. Later the family moved to a frame house on the Trevett Road, near the town line. The Fosdicks were eager to advance themselves and Solomon taught his trade to three of his sons. Torrey’s Corner’s with a population of perhaps twenty-five families, was beginning to show signs of future growth. The first industry that was established in Boston seems to have been a distillery at Torrey’s Corners, about 1818. No license was required in those days and drinking was very general. A mail route fromuffalo to Olean, through Hamburg, Boston and Concord was established in 1820 and a post office was opened at Torrey’s Corners with the name of Boston. There was a tannery in Torrey’s Corners and one on the Patchin Road, owned by a Mr. Stephens, and about this time Talcutt Patchin built another tannery here. A Presbyterian Church was organized here at an early date and in 1837 Solomon Fosdick and his son, John Spencer, built the building which still stands on the west side of Route 219 in the village of Boston. This building, known as St. Paul’s, has been used by several denominations. As early as 1814, a Baptist organization existed in Torrey’s Corners and in 1834, they erected a church building just south of where St. Paul’s now stands, but this was torn down many years ago. The Methodist Church was not formed until 1824 and the Boston building was built in 1852. In 1857, a German United Evangelical Church was incorporated and bought the Presbyterian building and took the name St. Paul’s Church. St. Martin’s Lutheran Church, on the Cole Road, was built in 1861, and in 1869 St. John the Baptist Roman Catholic Church was built on the Boston Cross Road. Apropos this account of a distillery and the churches a story comes down to us without documentation. It seems that in the 1850’s, there was a tavern across the road from St. Paul’s Church, and when it caught fire the neighbors hurriedly formed a bucket brigade to fight the fire. Although they were unable to save the building, they did save the stock of liquor which was carried across to the church. The owner was so graeful for their efforts that he invited them all over to the church where they consumed the stimulants. It was reported that they had such a merry time that it was necessary to redecorate the interior of the church after their revels. John Twining and Benjamin Kester with some other Quakers settled at what came to be known as North Boston. A sawmill operated there as early as 1816 and a tavern soon after. There was a family of Thayers, the father, Israel Thayer and three sons: Nelson, Israel Jr., and Isaac. They were a poor family and had borrowed money from a boarder, John Love. He lived with them when not sailing the lakes in summer or peddling in winter. In the fall of 1824, John Love disappeared after staying for a time with the Thayers. Soon after this the Thayer boys were observed to have more money to spend than formerly and to be riding Love’s horse about. When questioned thy said that he was away but had given them the use of the horse. Shortly after this they tried to collect debts owed to Love and when they produced a power of attorney, which was obviously forged, suspicion of foul play was aroused. The authorities offered a reward of ten dollars, quite a sum in those days, to anyone who could find Love’s body. Afteran all day search it was found a few yards from the cabin of Israel Jr. where it was buried in a shallow grave with some brush thrown over it. This was in the gully between the present Zimmerman and Heinrich Roads. All four Thayers were arrested and the boys confessed that they had murdered John Love. The father was freed but the three sons were hung on the west side of Niagara Square in Buffalo on June 7 th , 1825. The execution attracted a large crowd to whom a sermon was preached before the hanging. This story is the most widely known of any event in the history of Boston. A post office was opened in North Boston in 1832. In 1843, there were nineteen families living here, totaling forty-three people. In the fall of that year an epidemic occurred in which twenty-eight people were all ill and ten died. An investigation showed that all these families but one were using water from a well at a tavern. One man had quarreled with the inn keeper and his family secured their water elsewhere and was the only family to escape the illness. It was learned that a traveler had died of typhoid fever at the tavern shortly before the epidemic and that it was this disease which was prevalent. Without any doubt, the well had become contaminated and had spread the disease but apparently that was not understood at the time. We hope they closed the well. In any case, there seems to have been no recurrence. For several years following 1846, political conventions for the southern district of Erie County were held at North Boston by both parties. These brought many visitors to the town and enlivened the place considerably but after the Erie Railroad was built through Hamburg most of the conventions were held there. We do not know when the first school was opened in the town, but since there were three commissioners of common schools elected in 1818, there evidently were schools operating or contemplated. The early schools were very elementary and were open for only a few weeks in the year, as the children were kept busy at home most of the year. The Fosdick boys attended a school near where the Boston-Colden Road meets Route 219, and after finishing there, they walked to Springville to attend the Springville Academy. The Trevett Road was the only route to Springville then, but a walk of over twenty miles a day did not seem too great a price for an education. There were no school buses and they did not need a gymnasium.